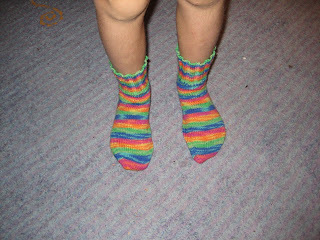 After seeing my knitting socks for the boys, Flossie took the opportunity to persuade her mother to knit socks for her. 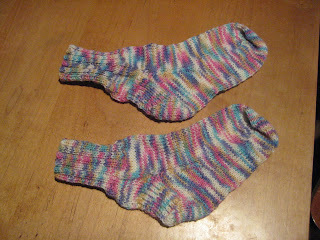 After nearly a year Julie decided that sock knitting was not for her and handed them over to me to finish. The yarn is the very pretty Regia 4-fadig color in colour 5025. Regular sock recipe knitted on 2.25mm needles over 48 stitches. 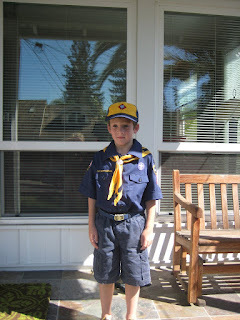 Adam joined the boy scouts this week. He had been about to burst with excitement before the first meeting, and was constantly taking every opportunity to point out ways in which he was already acting like a boy scout. Today the local pack did a fund-raising popcorn sale outside a local supermarket. Adam went along for one shift and had, apparently, a wonderful time. 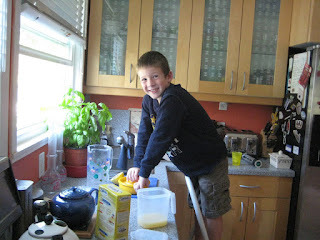 Now he is counting the days until the first scout camping trip. I have continued to work on my lizard ridge patches. I am loving how the colours develop through the pattern. I have 16 squares done out of 24 required. 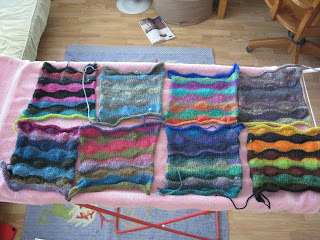 I have 4 balls of Kureyon left and I think I will also make some patched out of the scraps from the other squares. It's nice mindless knitting, but with the short-row pattern being enough to keep my attention. I can do a square an evening, so progress is pretty quick...but I dont want to finish this just yet so will be starting another project shorly. 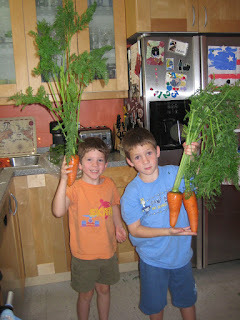 These came in the farm box this week - the boys though they were hilarious! Cast on 88 stitches and join to knit in the round. Row 13: k2tog break yarn and thread through remaining stitches. Secure. Cast on 11 stitches leaving approx 12” tail. Knit every stitch working back and forth. 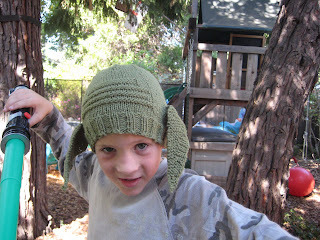 Use cast-on thread from ears to secure to hat at sides. I sewed the ears with a slight fold so that the top of the ear was slightly forward of the bottom of the ear to create a floppy appearance. 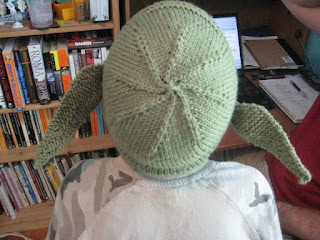 If anyone knits one of these I would be interested to hear about it! I made up the pattern, and it took me one afternoon and evening to knit it - which is good as I have at least one more in my future! Its knitted in 4.5mm needles in Rowan Pure Wool DK in shade 20. The hat took 1 ball with a few yards remaining. So, now to cast on number 2! Very lurid socks for Finlay. The usual recipe with a rib cuff and plain feet. 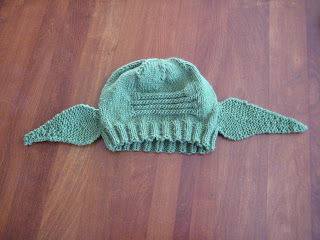 The yarn is Regia 4-fach Ringel color in shade 5048. I got this at the yarn swap with the Knitting Meetup. Despite it being over 95 degrees outside Finlay is insisting on wearing them! We had friends over for a BBQ so the boys made lemonade with the last of our lemons. I still can't get over having my own lemon tree - there was one outside the rental I lived in when I first came the the US and it seemed so exotic. I had tried to grow citrus in my conservatory when I lived in the UK but never with any success - so was thrilled to find a tree loaded with lush lemons in arms reach of my porch. When we bought this house almost the first thing we did was plant a lemon tree and an orange. The lemon is doing better and we get a reasonable crop these days so I almost never have to buy a lemon. 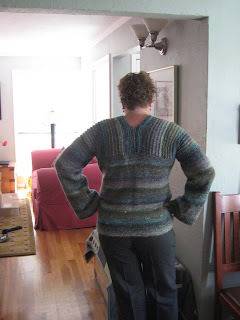 I finished my Klaralund sweater and I thinkI'm more pleased with this than I have been with any sweater for a while. Of course the lovely Silk Garden yarn helps, but the fit and style of this make it a really wearable garment...or at least I think it will be wearable once fall arrives here! I started knitting this in the UK on vacation, and had finished the knitting before I came back - so total knitting time less than a month. I lightly steam pressed the pieces before sewing it together. Although the knitting is mostly stockinette I dont seem to get bored of knitting it in the lovely colours. The sides have actually matched up pretty well although I made no effort to match them. I did have concerns about the horizontal stripes, but I chose a more delicate colour of the Silk Garden to minimize the stripiness, and I think that worked well. Details: The pattern is Klaralund from the Cornelia Tuttle Hamilton Book Number 2. The pattern comes with an errata which I found rather confusing because although there are additional sizes, they are replacements for the original sizes rather than additions. I actually knitted a combination of the 41" and 42" sizes. 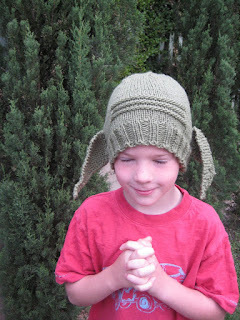 The pattern is really straightforward and easily lends itself to modifications. 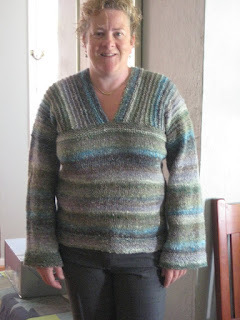 The yarn is Silk Garden in colour 268 and used a tad over 11 balls (rather than the 12 called for in the pattern). I seamed with sock yarn as the Silk Garden is rather breakable. I spit spliced the joins so no ends to weave in. A resounding thumbs-up for this sweater. Over the long weekend we discovered a new (to us) bike trail. 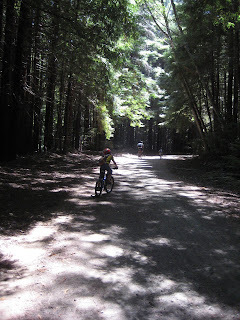 We drove out to Pescadero Creek State Park and rode the Old Haul Road Trail. 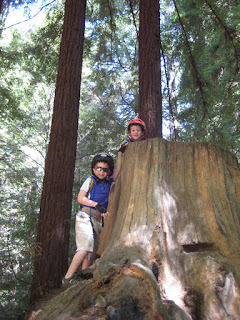 The trail is an old logging road that runs five miles between Portola Redwoods State Park and Pescadero Creek Park. The trail is quite hilly and we made it half-way there before turning back. When I say "hilly" I mean for small boys who found it rather hard work, we had to walk up quite a lot of the uphill grades, but they did enjoy the downhills! The trail is shady and was pretty cool, we didnt see much wildlife, but given the noise the boys make that is probably not surprising! There was not much other traffic on the trail. The whole area was logged until the mid-1970s and there is a lot of evidence of logging. 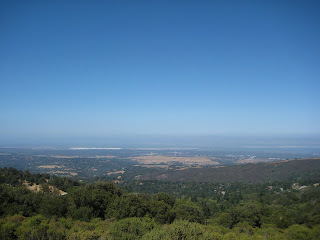 A large part of the area off the West side of Skyline Blvd is Open Space preserve, and various state parks.